When it comes to food, I’m pretty much game for anything. But, I’d like to think I’d try most anything once. 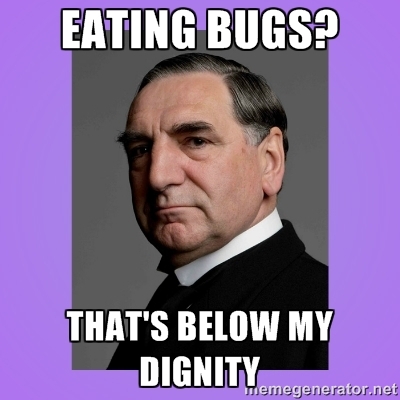 I don’t want to eat bugs, but if I was visiting a culture where people eat bugs, I might eat a bug. But like, I wouldn’t eat a bug on Fear Factor (is that still on?) or just at my house or whatever. I’m not going to sit at home and watch Downton and eat a bowl of crickets. So, to recap: I’d probably try almost anything, maybe a bug, but never bananas. I saw this recipe for Spam and Kimchi Fried Rice on Buzzfeed. Buzzfeed has been doing this fun series where they have a chef come to their office and make breakfast. 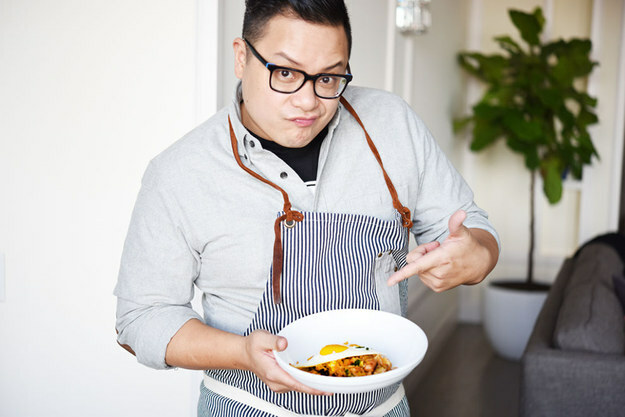 The latest chef contributor was Dale Talde. 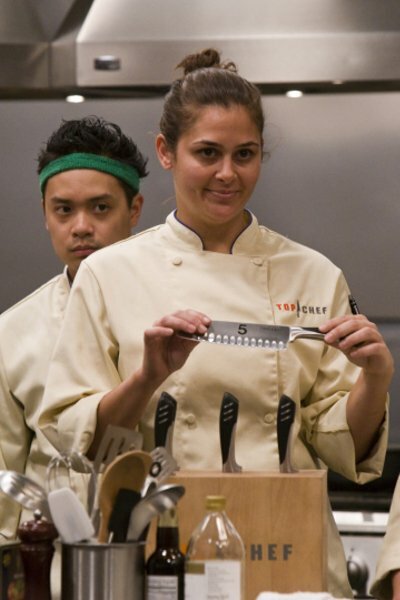 For those who don’t know, Dale Talde is a Top Chef alum who was on my favorite two seasons (season 5 Chicago and season 8 All-Stars). He was a punk (season 5), but he really has a heart of gold (season 8). I feel like we could be friends. Dale always made really inventive food and was a pretty funny dude with a great laugh, second only to Tre Wilcox (season 3/season 8.) He also has a bunch of really killer restaurants in NYC. I’ve been to Pork Slope in Brooklyn and it was legit, especially since it combines my two favorite things: pork and puns. Pork and Puns will be the name of my cookbook/comedy memoir, by the way. So, when I saw this Spam and Kimchi fried rice recipe, I was excited. When two of my friends sent me the recipe, I knew I had to make it. It was time to try Spam. If you’ve never opened Spam before, it will bring back some memories of opening cat food for the neighbors cats while they’re on vacation. (The cats weren’t on vacation…the people were….was that clear?) It has a golden pop top situation and there’s some gelatinous meat juice around the Spam, which add to the cat food-ness. It’s fairly disgusting to behold. And touch. It absolutely does not feel like real meat. But this dish? This dish is awesome. Honestly. It’s just awesome. There are a lot of steps, but it’s not hard. Get your mise en place in place. (Nailed it.) Then go to town. The Spam is essential and it’s great. I really and truly stand corrected. It brings a salty, porky, meat-like punch to the dish. Don’t skip the kimchi. It adds some spicy funk to the party, which every party needs. Also, it’s a probiotic according to the jar! Think about that! But not too much cause ew! So, do yourself a favor. Try something new today. Buy yourself a can of Spam and make yourself some Spam and Kimchi Fried Rice. It’s what Dale Talde would do. God Bless Spam and God Bless the USA. To make the rice: First, rinse the rice by pouring it into a medium pot or bowl, covering it with cold water, then draining it in a fine mesh strainer, shaking the rice to get as much water off as possible. Then, in a medium sauce pot, combine the 2 cups of rice with 2 cups of cold water. Bring the mixture to a boil over high heat, then turn the heat all the way down to low, cover, and let the rice cook, covered, for 23 minutes. Then, turn the heat off but DO NOT UNCOVER THE RICE. Let it sit, covered, for 10 minutes. After 10 minutes, uncover it, fluff it with a fork, and set it aside in the pot while you prepare the other fried rice ingredients. Heat 2 tablespoons canola oil in a large cast iron skillet over medium high heat. While the oil heats, crack the 2 eggs into a medium bowl and beat them together with a fork until the yolk and white are thoroughly combined. Add the beaten egg to the hot skillet all at once, then use a spoon or spatula to constantly move the egg around the skillet, When the egg is fully cooked but not browned, about 30 seconds, slide it out of the skillet and onto a plate, and set it aside. Return the skillet to medium-high heat, then add the remaining tablespoon of canola oil and the cubed spam. Cook the spam, stirring occasionally, until it’s golden brown on all sides, about 3 minutes. Add the diced onion and minced garlic, stir everything together, and continue to cook over medium high heat just until the onion has started to soften, about 2 minutes more. Make sure to stir often, so that the garlic doesn’t burn. Add the chili flakes, sesame oil, kimchi, and butter, then stir everything together and cook for about a minute, just to heat the kimchi. By now, the mixture may have started to stick to the skillet. Add the reserved kimchi liquid (about 1/3 cup) and stir to deglaze the skillet (the liquid will release all the stuff that’s stuck to the bottom). Add the cooked rice, stir, then add the cooked egg, sliced scallions, and fish sauce(optional). Stir thoroughly so that the egg is in bite-sized pieces and everything is evenly distributed throughout the rice. Turn the heat to low to keep the rice warm while you fry the eggs, stirring every minute or so to keep the rice from sticking. To make the eggs, melt butter in a large nonstick skillet over medium-low heat. (If you don’t have a large nonstick skillet, use a small nonstick skillet and work in two batches.) When the butter is melted, crack the eggs into the skillet. Try to keep them separate but if the whites touch, that’s OK. Season with salt and pepper, then let the eggs cook over medium-low heat until the whites are set but the yolks are still runny, 3-4 minutes. Divide the fried rice evenly among four plates or bowls, then top each portion with a fried egg. Serve immediately.